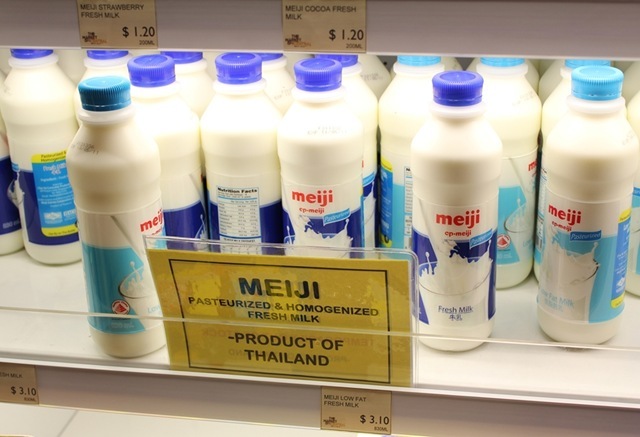 Did you know that Meiji Milk is a product of Thailand? I’d always thought that the milk came from cows born and bred in Japan! I’ve always liked the milk from Meiji for its particularly unique taste. Can’t quite put my finger to it, except to say that it doesn’t taste like the usual fresh milk. It seems ever so slightly sweeter too. I checked the ingredient list (as I always do for everything that I buy at the supermarket) and it’s 100% fresh milk. I haven’t been drinking Meiji Milk for a few years. A friend once told me that milk should not be stored in bottles where the milk can be exposed to light. Apparently, light from the florescent tubes in the supermarket can cause the vitamins and minerals to break down. Also, the thick plastic bottles that Meiji uses isn’t all that good for the environment. These days I just go for Marigold Fresh FULL CREAM milk. And don’t let me get started on why it is better to drink full cream milk than skimmed milk. Which is why my family drank alot of Meiji while in Thailand.. haha. Cheap and fresh! Haha that’s good. 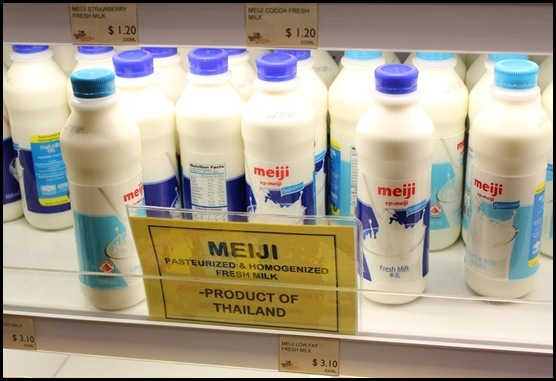 Wish we had cheap milk in Singapore. I hear an organic dairy farm has just been set up by some Ang Moh. Going to check that out soon. In Japan, it’s “Made in Japan”…. Haha. I didn’t know they also pateurised their milk in Thailand 😀 How cool! Think most countries pasteurise their milk nowadays? It’s not necessarily better though. There is a trend where now people want their milk raw and unpasteurised as pasteurization can actually kill some of the nutrients? I prefer full creamed milk too 🙂 Used to like Meiji but somehow it doesn’t taste as good as it used to. Maybe I just wanted a new taste. Tried Organic and it was soo good..but just too expensive. Today I went with some family to Central Rama 9 for Ice skating. The ticket sellers were so unpolite and missused the meiji promotion, that I decided not to go there anymore and not to drink Meiji milk.